ProGear sells high quality replacements for Castelgarden 82207200/0. All of our Castelgarden spindles are made with the highest quality materials. Castelgarden 82207200/0 is a drop-in replacement spindle for your current Castelgarden lawn mower spindle. For ordering information please fill out a contact form, email or call 502-689-9455. Castelgarden is a leading European brand, well-known for its ride-on mowers and powered garden equipment. Through product development, Castelgarden strives to maintain collection efficiency and power, performance even in the most difficult mowing conditions, as well as design and comfort. ProGear strives to provide the highest quality replacement parts in the spirit of Castelgarden’s performance standards. Powerful and safe, technologically advanced and aesthetically pleasing, easy to use and exciting to drive, the high quality of Castelgarden products is a winner every time. Look no farther than ProGear for all of your Castlegarden spindle needs. 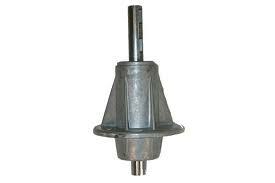 Our spindles are a drop-in replacement for 82207200/0.